(1) Weed density should be reduced to tolerable levels. 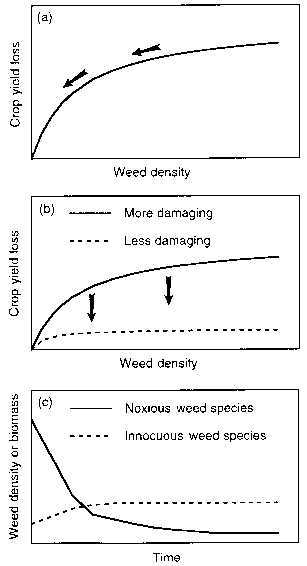 Experimental studies with a range of species indicate that the relationship between crop yield loss and weed density can be described by a rectangular hyperbola (Cousens, 1985; Weaver, Smits & Tan, 1987; Norris, 1992; Blackshaw, 1993; Knezevic, Weise & Swanton, 1994; Chikoye,Weise & Swanton, 1995).The specific parameters of this relationship change with differences in weather and soil conditions, species combinations, and other factors (Mortensen & Coble, 1989; Bauer et al., 1991; Lindquist et al., 1996), but, in general, reductions in weed density reduce crop yield loss (Figure 1.1a). Although the relationship shown in Figure 1.1a might argue for total elimination of weeds from crops, eradication efforts may be excessively expensive, incur unacceptable environmental damage, and deprive farmers and others of the ecological services certain weeds provide. Thus, with the exceptions of particularly noxious or invasive species, weed management rather than eradication is desirable. 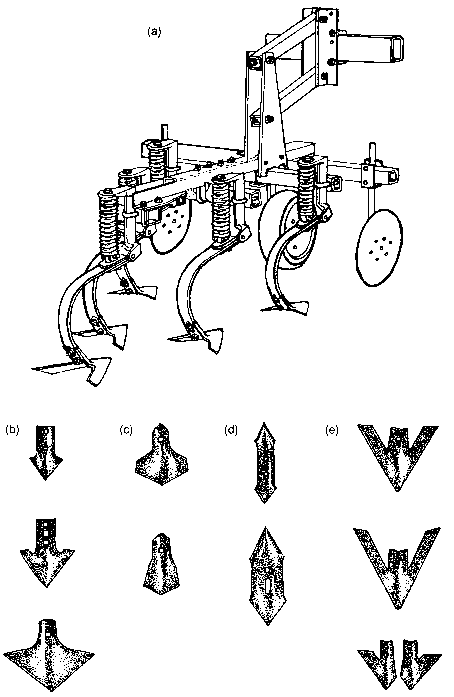 Figure 1.1 Three objectives of weed management: (a) reducing weed density to decrease crop yield loss; (b) reducing the amount of damage a given density of weeds inflicts on a crop; and (c) shifting the composition of weed communities from undesirable to desirable species. by (i) delaying weed emergence relative to crop emergence (Cousens et al., 1987; Blackshaw, 1993; Chikoye, Wiese & Swanton, 1995), (ii) increasing the proportion of available resources captured by crops (Berkowitz, 1988), and (iii) damaging, but not necessarily killing, weeds with chemical, mechanical, or biological agents (Kropff, Lotz & Weaver, 1993). (3) The composition of weed communities should be shifted toward less aggressive, easier-to-manage species. Weed species differ in the amount of damage they inflict on crops and the degree of difficulty they impose on crop management and harvesting activities. Consequently, it is desirable to tip the balance of weed community composition from dominance by noxious species toward a preponderance of species that crops, livestock, and farmers can better tolerate (Figure 1.1c). This can be achieved by selectively and directly suppressing undesirable weed species while manipulating environmental conditions to prevent their re-establishment (Staver et al., 1995; Sheley, Svejcar & Maxwell, 1996). Selective vegetation management is particularly well suited to agroecosystems dominated by perennial plants, such as orchards, pastures, and rangelands. Other, broader objectives are also important for weed management systems. Because farming is beset by uncertainties caused by variations in prices, weather, and pests, farmers seek weed management systems that predictably and consistently suppress weeds and reduce risks of crop yield loss. Convenience and profitability considerations lead farmers to seek weed management systems that use a desirable blend of labor, purchased inputs, and management skills. Farmers also seek weed management systems that fit well with other aspects of their farming system, such as crop sequence, tillage, and residue management practices. Over the long term, weed management systems are needed in which the number of effective management options holds steady or increases, rather than decreases. Finally, weed management systems need to protect environmental quality and human health. What specific practices can be used to regulate weed density, limit the competitive impact of weeds, and manipulate weed community composition in ways that are compatible with broader, more systemic management objectives.? Weed density can be reduced by using tillage practices and crop residues to restrict the number of microsites at which weed seedling recruitment occurs (see Chapters 4,5, and 7). 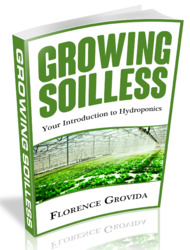 Weed density can also be reduced by using tillage and cultivation tools (see Chapter 4), biological control agents (see Chapter 8), grazing livestock (see Chapter 9), and herbicides to kill or displace weed seeds, vegetative propagules, seedlings, and mature plants. Monitoring and decisionmaking are key components of managing weed density, and the development and implementation of procedures for doing so are discussed in Chapter 3. Weed competitive ability can be reduced by killing early-emerging cohorts of weeds with herbicides or cultivation tools (see Chapter 4) and by choosing particular crop densities, spatial arrangements, and genotypes to enhance crop resource capture and competitive ability (see Chapter 6). Sequences and mixtures of different crops can also be used to preempt resources from weeds (see Chapter 7). Allelochemicals released from live crops and crop residues (see Chapters 5, 6, and 7), biological control agents (see Chapter 8), grazing livestock (see Chapter 9), and herbicides may be used to damage weeds and improve crop performance. Desirable shifts in weed species composition can be promoted by tillage practices (see Chapter 4), grazing practices (see Chapter 9), and manipulations of soil conditions (see Chapter 5) and crop canopy characteristics (see Chapters 6 and 7). Selective herbicides can also be applied to alter weed species composition. Currently, herbicides are the primary method for managing weeds in industrialized countries and are becoming more widely used in developing countries. Although we do not believe that they should be excluded from the weed management tool kit, we have given them relatively little attention in this book. There are four reasons for our orientation. First, a large amount of information about herbicides and their effects on weeds and crops already exists, whereas much less information is available about other management tactics. We hope this book contributes to the closure of that information gap. Second, we believe that, over time, heavy reliance on herbicides reduces their efficacy by selecting for resistant or tolerant weed species and genotypes. To maintain the effectiveness of herbicides as weed management tools, weeds should be exposed to them as infrequently as possible. Third, we believe that certain herbicides can jeopardize environmental quality and human health. To minimize the potential for damage, effective weed management systems that are less reliant on herbicides are needed. Finally, herbicides constitute a rising proportion ofcrop value at a time when farmers are challenged by serious economic pressures. To promote farm profitability, there is an important need to develop effective weed management strategies that maximize opportunities for farmers to reduce input costs and increase the value of the crop and livestock products they sell. We examine these points in more detail in the following sections. What is objectives of weeding? What are the objectives of weed control? What is objective of measurment weed density? What is the objetive of weed management.? What are the aims of weed prevention?